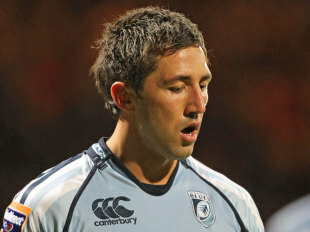 London Welsh are ready to offer Gavin Henson a route back into top-flight rugby following their promotion to the Aviva Premiership. The Exiles this week successfully appealed against the decision to block their promotion to the Premiership. And now their place among England's top clubs has been confirmed they are ready to supplement their Championship-winning squad with more top-quality talent for the coming campaign. Henson, whose contract with Cardiff was terminated in April after an incident on a flight from Glasgow, had talks with London Welsh earlier in the year. And the former Wales international could be set to link up with Exiles director of rugby Lyn Jones, who worked with Henson at the Ospreys. "We haven't spoken to Gavin since much earlier in the year, but we are obviously now very much in the market for players of proven quality and Gavin Henson has proved himself to be that time and time again," London Welsh managing director John Taylor is quoted in the Sunday Telegraph. "It is certainly possible that we will be back in touch but in that event London Welsh would need assurances from Gavin that he is prepared to buy into our team ethic, our pay scales and that we would not just be a base for his other careers." "Henson's not innocent - he's made a mistake, like every other player. Like Danny Care did but he wasn't sacked by Quins. There are several hundred examples like this. It took a drugs scandal in Bath to get rid of some players. For Gavin to be hung out to dry like this is inexcusable." London Welsh reportedly have eight spaces in their squad to recruit new players for their first campaign in the Aviva Premiership.